It’s one of my fondest memories of our trip to Europe last summer. I know I’ve quoted this before, but it’s really true: Happiness is a journey, not a destination. In the above photo we’re on a train, on a journey from Karlsruhe to Heidelberg, Germany . The kids are giggling because we pulled out the seats in our train compartment, which we had completely to ourselves, and were rolling around like we were on a giant bed. I miss those old train compartments. It’s rare to board a train car these days and find it’s one with cabins. 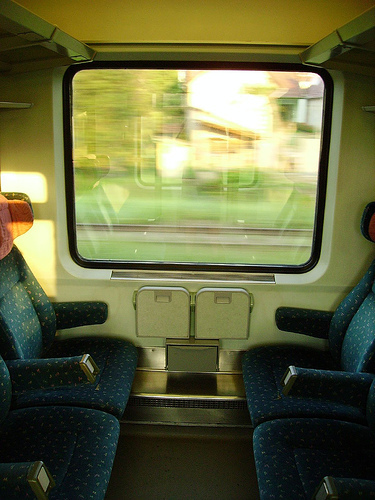 Most European countries have modernized their rail system with high-speed trains , resulting in shorter travel times and therefore less need for comfortable compartments, sleeper cars, and couchettes. Like on a bus. No more privacy. 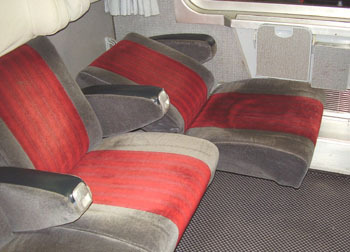 When all six seats are pulled out and the armrests are lifted, the whole compartment becomes the equivalent of a king size bed. And a whole lot of family fun. The convenience of trains in Europe is so wonderful. Looks like a fun trip. Love that entire idea of slowing down to take a train trip. Wow.. that first picture... I can't believe that is a train! The train looks so fun! What a wonderful time with your children! Thanks for stopping by my blog! Fantastic Yar, Wat a comfortable n lovely journey you had! The train looks so fascinating & it is forcing me to travel on that at least for once!!! I love the old trains. When I studied abroad in Germany, I'd travel every weekend with fellow students, and it was always so fun to have the compartment to ourselves and to just be able to goof off without bothering anyone else.